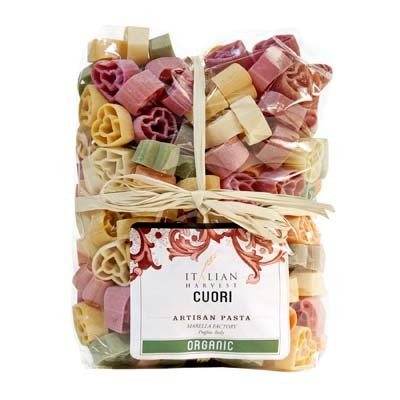 A unique pasta creation, this pack of Organic Cuori Multicolored Hearts is by Marella. The colors are all from 100% natural dyes. This colorful heart shape pasta is perfect for romantic dinners such as anniversaries or Valentine’s Day, or just any special occasion. You can even serve this type of pasta with all kinds of tomato or cream sauces. It may even be best with savory meat sauces such as ragu. If you’re planning a romantic dinner with your special someone, this would make a great main dish. So grab a bag of these yummy Multicolored Hearts today!